Angle of repose is defined as the minimum angle made by an inclined plane with the horizontal such that an object placed on the inclined surface just begins to slide. Let us consider a body of mass ‘m’ resting on a plane. Also, consider when the plane makes ‘θ’ angle with the horizontal, the body just begins to move. Let ‘R’ be the normal reaction of the body and ‘F’ be the frictional force. 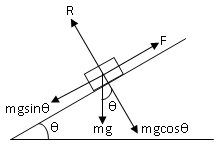 Angle of repose is equal to angle of friction.